Grenada is well known as the spice island, and it produces an impressive selection of spices, in amazing quantities. Indeed, it is hard to drive in the rainforest for more than a few minutes without spotting a nutmeg tree, and Grenada’s flag has a picture of an open nutmeg fruit on it. Grenada also produces and exports many other varieties of spices, such as cinnamon, cocoa, cloves, and allspice. 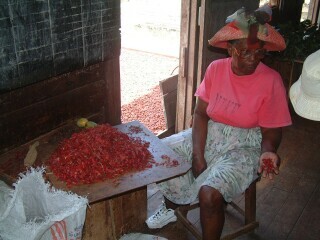 Spice harvesting and packaging is an important part of Grenada’s economy. Most island tours include a visit to a place that processes the spices, and ours was no exception. We went to a small, hand-operated spice factory run by locals, mainly women. 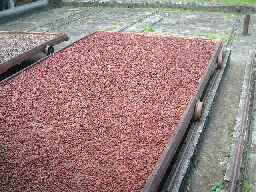 Outside, there were huge, flat platforms that moved on rails, and they were covered in cocoa beans. Inside, the building was dim and looked like it had hardly changed for 100 years. There were small tables covered in spices near the windows, with women sitting at the tables, examining and sorting the spices. The windows offered the best lighting and had no glass; just wooden shutters that were wide open for the best possible airflow. The thing I most noticed as I entered, however, was the smells. The place smelled like every spice I knew of, all mixed together. One smell would be stronger in one place than in another, like mace at one table, cocoa at another, and cinnamon at a third table. It smelled as if every jar in a kitchen spice rack had been smashed together, and the mixed powders thrown into the air. Some places the smells were so mixed that it was almost impossible to determine the different scents. We were guided past a few tables to one with a collection of different spices, in various stages of processing. Our guide started by telling us about Grenada. She explained that Grenada grew many spices, and that harvesting and processing them is something that has been done for a long time on the island. As she went on to explain the processing, I could understand that it would have taken long time to discover and perfect the methods. One of the things she told us about was the nutmeg. Grenada has huge quantities of nutmeg, but when you see them on the tree, they look more like pale apricots than spices. The outside is a pale pink, the shape and size of a ripe apricot, but very firm. 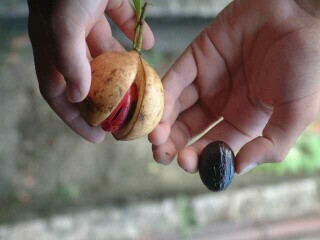 When the nutmeg is ripe, the solid shell inside the fruit gets so big that it forces the fruit open. The shell is bigger than most grapes, but smaller than a golf ball. It is very dark and hard, but is covered in bright red stripes that run in lines and patches down the shell from the top. This is the spice mace. It is cut off the shell and processed separately. The nutmeg is then dried out in the shade for several days, because sun will damage them. It is then cracked out of the shell and ready to be ground and used as a powdered spice. The fruit can be used for making jams, but is not eaten plain. The mace is dried, sorted, and ground for use. We also learned about cocoa. 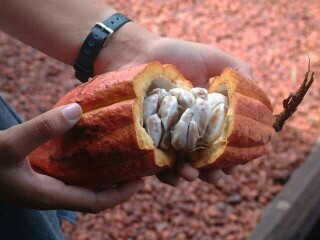 Our guide took a cocoa pod and cut it open, revealing the beans. She pointed out the huge drying platforms, and told us how the cocoa was not good to eat until it was processed. It is horribly bitter, and not sweet at all. Plain cocoa is also unbelievably strong. Unsweetened baking chocolate is almost mild by comparison. She also told us how cinnamon is actually the under-bark of the tree, and the outer bark is scraped off before the cinnamon is carefully peeled and collected. We also learned about the various other plants and leaves that are used as spices, such as cloves, allspice, and a few others. Although we did not spend very long at the spice factory, I was amazed by what I had learned. I had never considered the effort behind producing the small glass bottle full of cloves or allspice, or the work that goes into sorting and preparing a few nutmegs.